*Bamboo People by Mitali Perkins. Charlesbridge, 2012 (reprint). 288 pages. All Chiko wants to do is support his mother by earning a little extra money, preferably in a quiet, academic vocation. Ever since the Burmese government took his father for “crimes,” it’s been up to Chiko to be the man of the house. 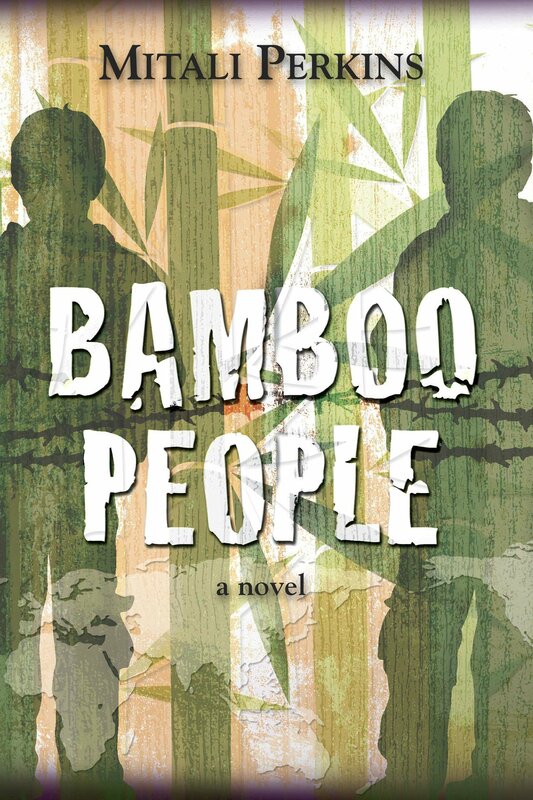 When he answers an ad for a possible job, however, Chiko ends up “recruited” (forcibly) by the Burmese government to join the army in their battle against the rebel Karenni people. Tu Reh and his family are struggling along in a Karenni refugee camp, hoping to defend themselves against the vicious Burmese soldiers. Their people have lost land, homes, and entire ways of life; the refugee camps have become a new sort of civilization with new rules and leadership. Tu Reh knows it’s wrong to be bitter, but how can even a Christian love an enemy like the Burmese? Both Chiko and Tu Reh have to face their dragons in this quickly moving coming-of-age novel. As one boy learns to be courageous, the other learns to be tenderhearted. Both become brave in new ways, and both grow into new leadership opportunities. Although their reconciliation to one another is predictable as a final outcome, the journey is worth the read, and the ending is not saccharine. A tremendous picture of what it means to love our enemies, to face the challenges before us, and to sacrifice for those we love, Bamboo People is not to be missed. In addition to a great story, readers will understand a bit more of the conflicts in places like modern-day Burma. Do take the time to discuss this one with your kids. It doesn’t have to be an “official” discussion, but with so much conflict on earth this side of heaven, we can’t have too many conversations about how to love our neighbors (especially when they’re also our enemies), how to follow the Lord when he calls us to do something hard, and how to pray for Christians in other countries! Mitali Perkins is the author of our Faith, Fiction, & Fellowship teen read: You Bring the Distant Near (also a starred review). If your girls are reading that, hand your boys Bamboo People! We’ve also reviewed Tiger Boy by Perkins (another starred review), which is a good choice for younger kids, especially boys. Today, we’re also reviewing Rickshaw Girl, perfect for younger girls. It’s not too late to join in the read-along fun, either!